Radha Pandey discussed papermaking by hand in India and what that process entails, as well as traditional dyeing techniques alongside her own experiments with non-traditional natural dyes. 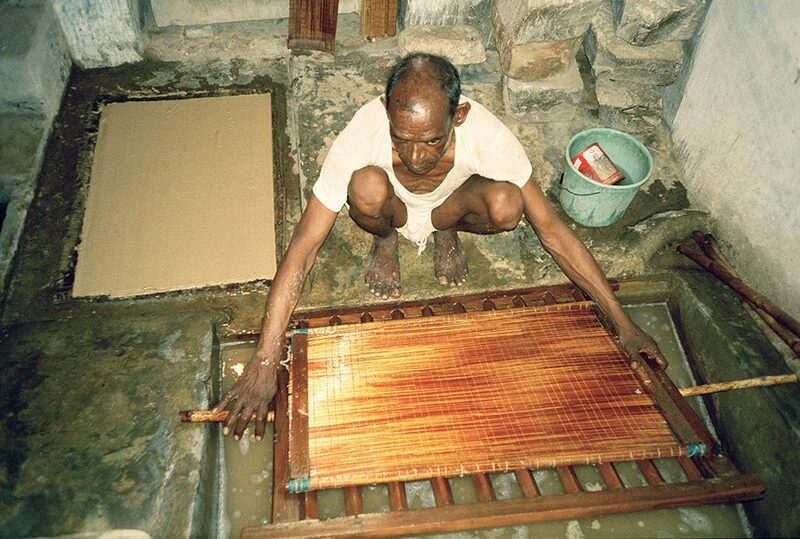 Pandey discussed the history of this kind of paper, and then went on to describe each step in this traditional papermaking process, from the beating of the fiber with large wooden hammers, to the techniques used for pulling sheets, to burnishing the paper on curved wooden boards. Pandey noted that the position the papermaker is in while pulling sheets influences the quality and thickness of the paper, as does the floating action of the mould when in the vat of pulp. Pandey argues that when pulling sheets from the vat, the seated or squatted position of the papermaker is what allows them to consistently make the same thickness of paper throughout an entire run. 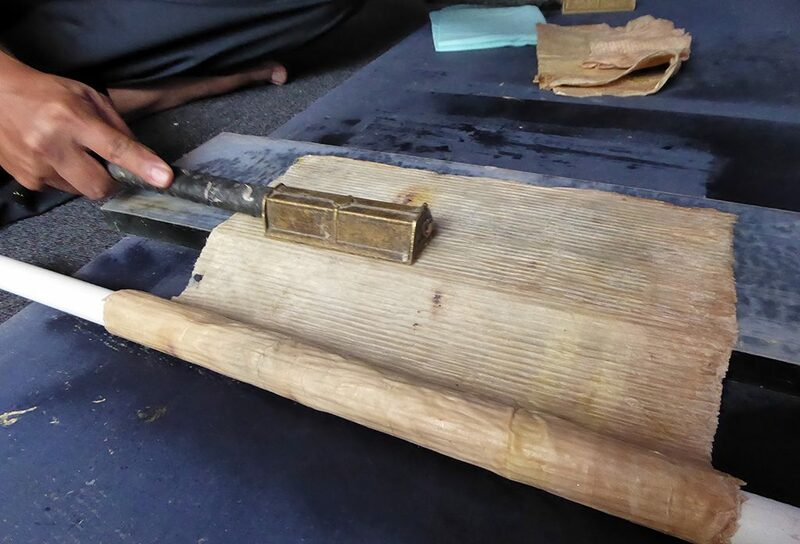 Lisa Miles discussed the history and technique of making Indonesian Daluang beaten bark paper. Miles’ talk drew on her experience making this beaten bark paper while in Indonesia over the past year, as well as her interactions with various Indonesian beaten bark papermakers and contemporary artists. Beaten bark paper is called such because it is formed by beating strips of the white bark of a paper mulberry tree with either contemporary metal or traditional stone beaters into thin sheets, which are then fermented, dried, and burnished or smoothed to produce a usable finished sheet of paper. Though the acceptance of beaten bark paper as a true paper is controversial, Miles argues that it is paper and should be recognized as such. Miles also discussed the related creation of beaten bark cloth, more commonly known as tapa, and the artisans who produce it. The practice of making Daluang died out in the 1960s because of a lack of material, and only recently has been revived with the help of a select few contemporary Indonesian papermakers and artists. Scott Skinner discussed traditional Japanese kite making and its impact on contemporary kite makers. Kite making and flying were very popular activities in 1800s Japan, so popular in fact that a law had to be passed to limit the amount of kites flown in public spaces. Kites created a camaraderie between kite makers, artisans, kabuki actors, and others of the lower classes, and were often used to stand up to the law, whether that meant illegally depicting recognizable people on the kite faces or using them to make fun of the local feudal lord. 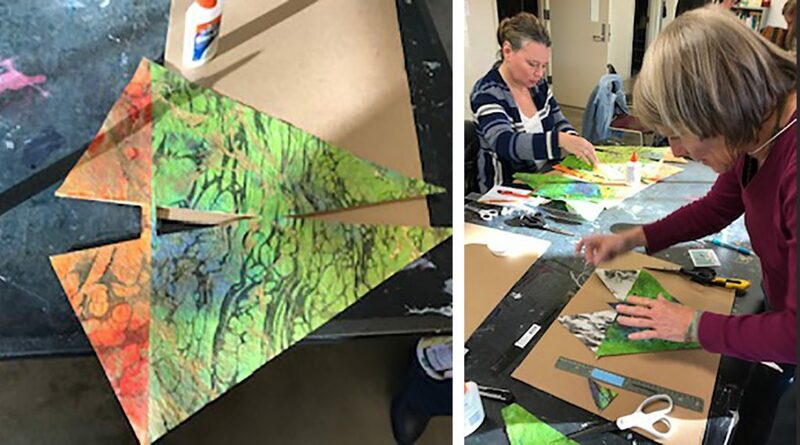 From these historical kites and depictions of kites in works of art, contemporary kite makers like Skinner are able to learn about the traditions that surround Japanese kite making as well as how to construct them, and so they can use them to inform their own kite structures. Kathryn Rouw is a certificate candidate at the University of Iowa Center for the Book.